Nearly two years after a court-ordered judgment, a Phoenix-based mortgage help company still has not begun to make customers whole. PHOENIX, AZ — Nearly two years after a court-ordered judgment, a Phoenix-based mortgage help company still has not begun to make customers whole. 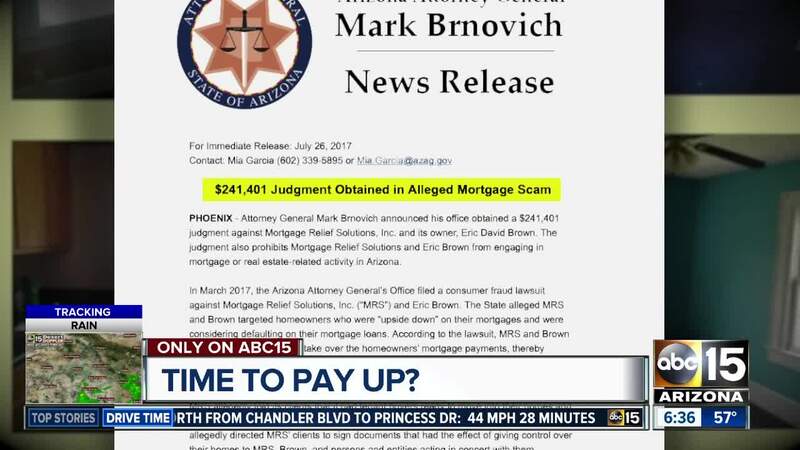 In 2017 the Arizona Attorney General's Office (AZAG) sued Eric Brown and Mortgage Relief Solutions (MRS) for allegedly violating the Arizona Consumer Fraud Act. According to the complaint the company promised to take over mortgage payments for homeowners who wanted to avoid defaulting on their loan. They would sign the title over to the company, and a renter interested in buying the property would be placed in the home by sister company Lease With a Plan. But the complaint alleged that Brown kept the money for himself. Let Joe Know found homeowners from Arizona to Maryland who say the company either stopped paying the mortgage or didn't pay it at all. Some found out about the delinquency in enough time to negotiate with their banks, but others were forced into foreclosure or even bankruptcy. Doug Cross in Maryland signed over his condominium. "But my name is still on the mortgage, so you know I can't let this go on." He says he filed bankruptcy to prevent foreclosure. The business shuttered and Brown stopped answering our calls and emails. Brown and MRS were issued a default judgment after failing to respond to the State's lawsuit. The judgment orders Brown, Mortgage Relief Solutions, and “any person or entity acting in concert with them” to relinquish any claim or authority they have over properties that were signed over to them. And ordered to pay more than $240,000 restitution and civil penalties to nearly two dozen consumers who lodged complaints with the AZAG, after failing to respond to the State's lawsuit. The AZAG says none of that money has been paid. We caught up with Brown at a local tax preparation business to find out. While standing halfway inside the building Brown explained that he did not own the company. "I worked for them. I had a pay stub. The person who owned it passed away." According to documents filed with the Arizona Corporation Commission in 2016 Brown is listed as Secretary of the company. A woman named Tamika Shelby is listed as a director. Shelby is not named in the default judgment. Each of the homeowners we spoke to say any deals they made were with Brown and another woman who answered the phones but was also not named in the default judgment. "They went after me because the person died. I was the only one who ran the business for them," Brown said. He also said he did not have his day in court. He did not offer an explanation why he was not able to defend himself. We asked what happened to the money? "I don't have access to bank accounts. The person's family took that money," he said. We asked if he was responsible for anything? "No sir. I'm not responsible because if I was I would have went to jail. I'm not responsible," Brown said. "Under the Consumer Fraud Act, the question is not what position a person held in a company, it is whether that person engaged in deceptive or unfair acts or practices. The State alleged in its complaint that Eric Brown repeatedly and deliberately made misrepresentations to consumers, and Mr. Brown refused to respond to the complaint. The Court entered judgment against Mr. Brown and Mortgage Relief Solutions, jointly and severally, so he is legally obligated to pay the entire amount of the judgment." The office says it will continue to pursue payment from Brown, and while it does not handle title transfers, will confirm the legitimacy of the judgment for homeowners who still need to transfer their titles back into their names, if requested.